Today marks my last day as an intern for Citizen Matters. It’s been quite the journey, one I started back in January of this year that led me to ten weeks of reporting in India. I graduated from the University of Washington on June 10th and arrived in Bengaluru on June 17th ready to start my international reporting experience and post-graduate life. I was given the chance to intern in Bengaluru for Citizen Matters through a scholarship awarded by an alumna of the University of Washington’s Journalism Department from which I recently graduated from as well. Each year this alumna allows five journalism students to spend their summer in one of five developing countries in Asia and the Middle East to work as reporters, a program we call “Foreign Intrigue.” One more journalism student is sent to Mexico through a scholarship awarded by the University of Washington Communications Department. The thought behind this is to gain real world experience as journalists while also experiencing a culture completely different from the Western world and the chance to travel afterward. Our generous donor spent time after her college graduation working in Asia and hopes to give other blossoming journalists the same opportunity that made such an impact on her. In total six reciprocates from the University of Washington Journalism Department are given this international reporting experience every year. I am one of those reciprocates. Each year six publications agree to each take one of us for a ten-week internship. I was obviously sent to India and am the fourth reciprocate of this scholarship to work for Citizen Matters. My five peers are currently interning in Cambodia at the Cambodia Daily, in Sierra Leon at Awoko Newspaper, in Indonesia at the Jakarta Globe, Jordan at the Jordan Times and in Mexico at Cimacnoticias. I applied for this scholarship, which covered my round-trip flight and housing and placed me with Citizen Matters, back in January something I was aiming for since I was admitted into the journalism program two years ago. From the start I so badly wanted to be the one chosen for India. There are many reasons for this, the vegetarian food, the weather, the culture, the people, and of course the publication. I really admired the work being done by Citizen Matters before I had met any of my colleagues or had stepped foot in India. I knew I would grow as a journalist and enjoy the type of writing I would be assigned so I practically begged to go to India in my application. After two intense rounds of interviews where I was not only asked the usual questions like why I wanted to go abroad and what challenges I expected to face, but also a few unusual questions as well like if I’ve ever been really really really sick, what was the worst thing that had ever happened to me and if metaphorically speaking India was a bear how prepared am I to dance with the bear (actual question I was asked) I landed the scholarship and internship. Let me add that I graduated from a very prominent university with a low acceptance rate and was admitted into two competitive majors while I was there but applying and being awarded this scholarship was probably more difficult than any of that. It’s one of the highest awards a UW journalism student can achieve. Because there are only six of us who received this opportunity we had regular meetings with the coordinating professor about how to stay safe, what the media landscape is like in our respected internship countries, talks about fluffers, stringer and translators (fancy journalism terms for sources abroad) and checking off long to do lists. We met with the people who had received the scholarship for our internship in the past, watched YouTube videos on our countries, read books and took a self-defense class. At one of these meetings I announced that I was most looking forward to having chai throughout the day. I was told about India’s chai obsession, but would never know how much it would impact my daily life until I got here. Then I was sent to work on everything that had to be done before I could travel alone to India, like vaccinations, packing lists, finding housing, booking flights and wringing advice out of literally anyone in the nearby vicinity who had traveled to India. The six of us are working and living in different countries around the world, contributing stories to our respected publications and actively posting on social media sharing our stories to our friends and family. I always read all of their stories and even though I have no clue what daily life in Cambodia is like, cannot even begin to relate to living in Sierra Leon, don’t know a single word in Spanish, have very little knowledge of what’s currently happening in Indonesia and am unfamiliar with journalism in Jordan, I know each of them is working just as hard as I am to burst out of our protected college journalism bubble, not just into the cut-throat world of journalism but in places that often seem like different worlds from what Seattle. There are only five other people in this world who went through this process with me and can understand how much this experience has impacted me as a journalist and as a person because I’m sure they’re having a similar experience. The funny thing is we’re all living in different time zones right now. On June 15 after three days of being too excited to sleep I finally started my twenty-four hour journey to Bengaluru. 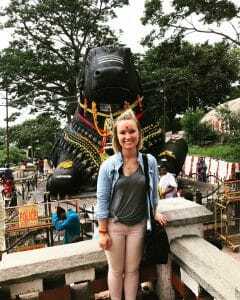 After months of preparation and cramming as much advice and knowledge into my head about India as I could I forgot almost all of it the minute I stepped out of the airport into the bright, hot, loud and colorful reality that confronted me. That was ten weeks ago and I would like to think that I have mastered living in Bengaluru, but the truth is there is still a surprise around every corner, just like the bear metaphor that was used to describe India in the interview that got me here in the first place.